How is it that we can enter a place and feel … something: aesthetic engagement, emotional resonance, at times an almost deja vu memory and familiarity, a comfort, a relationship? And in other places, even places designed by smart people to provide those attributes just mentioned, how is it that we feel … nothing? They can be like looking at or being in nowhere at all (see James Kunstler’s Web site, www.kunstler.com). It has, we’ve learned, little or nothing to do with size, or expense, or even intent. It just happens that, sometimes, fortuitously, out of the blue, you come upon locations that have arisen, mostly organically, that are so redolent of placeness that they practically define the term and rise to the level of art. And they can take your breath away, or insinuate themselves into your memory forever. Such a place is Phoenicia. At first glance, it is nothing special. At second and every subsequent glance, it is only special. 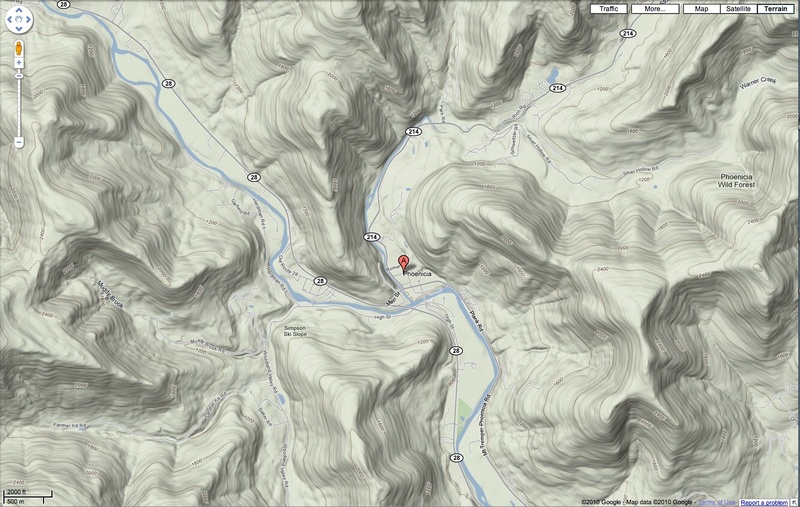 Take a look at the terrain-view map reproduced below (click on it to get a better look). There, amid a canyon of lurking, hovering mountains in the Catskill range – reminiscent, in a way, of images we’ve seen of the Yangtze River and its gorges, both having verdant gumdrop-shaped mountain walls all around, with the New York version including the burbling Esopus Creek rushing through – Phoenicia, a not-so-distant neighbor to the equally magical Woodstock, has set up shop. We stayed in a funky motel complex just off the main drag in town. Notable – beyond the level of funkiness, which was extreme – was that if you walked out your door you practically walked into a side of a steeply rising mountain. The mountains here are so abrupt and surprising that they appear to be distinct entities rather than part of a chain. The town as well as the setting, for us, is the draw. It is intentional only in that its site was selected; beyond that, it has grown as it needs and wants to. For those familiar with the revered TV series “Northern Exposure,” this IS Cicely, Alaska – in the flesh. The main street, all several blocks of it, looks remarkably like that of the show. There’s even an eating establishment, Sweet Sue’s, that’s like The Brick, complete with a number of Shellys serving up perhaps the world’s best pancakes (and even a kicking tofu dish). There’s a general store. The bookstore doubles as the town library. And the night we spent there, we stumbled into an art opening at a second-floor gallery that was distinguished as much by the multitude of pot-luck dishes as by what was hanging on the walls. All that’s missing is Dr. Fleischman and Morty the Moose. It is a haven, a vision in the mist, a Brigadoon – and, yet, just a town. And, yet, more than a town – a place that is art by being artlessly itself, and unselfconsciously perfect in its form, suis generis yet representative of something we’ve lost in the rush to be big, and look the same, and set up divisive walls. And it coexists so well with its hidden and unlikely location. Placeness does not mean, solely, a spot where you feel you belong. But that can be one element of it. It can be a place where hope resides, or highest intentions – even the modest ones – are manifest, or where someone left a soul to be discovered and shared. Or where nature and the manmade complement and determine each other, each underscoring and threatening the other. 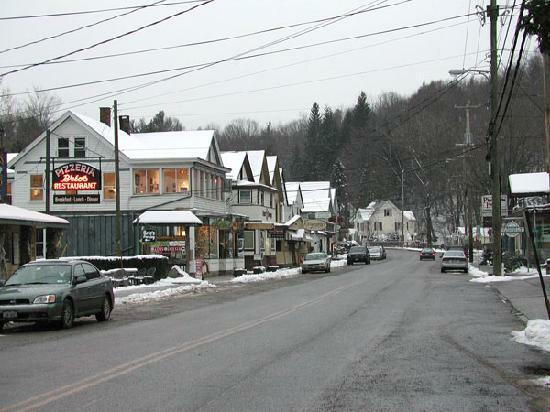 That placeness – for us, and for many who come there, for Sweet Sue’s or art openings, tubing or as a spot to stay during ski season, or for no set reason – against all odds can be found in Phoenicia. Pennypack is a city park that envelops the creek of the same name, protecting its watershed in a thin green ribbon along both banks from the overbuilt surrounding communities. Maybe for that reason alone, having a tribute art installation there to Walden is so appropriate. In the woods, not far from town – as with Thoreau’s sojourn – is a kind of tripartite monument to the famed Transcendentalist and his simpler life, reliant on and in partnership with nature. There is much less nature in general now than there was when Thoreau wrote his book, in 1854, although it is like this park, protected more now than it was then. Nature itself, in a sad turn of events, has become a kind of art installation in amongst the “civilized” and overdeveloped landscape. 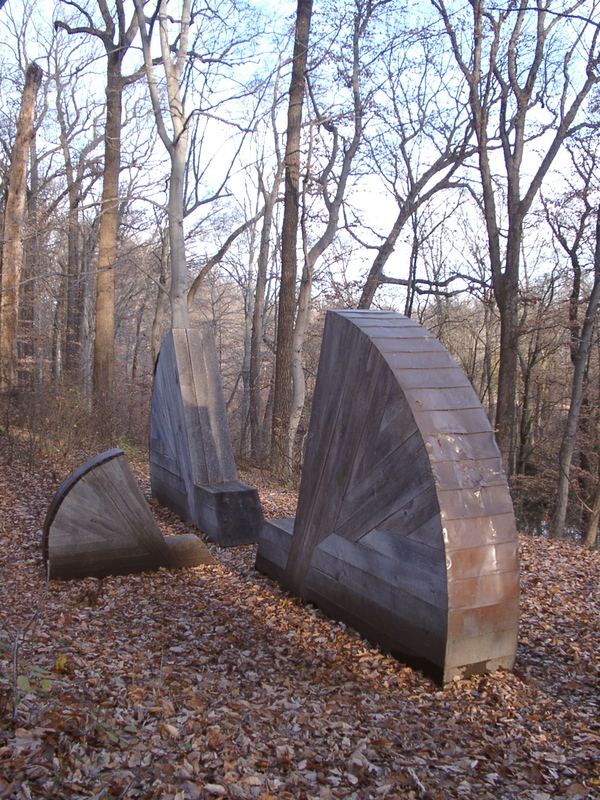 Drawn by the concept of the artwork, we went in search of the author’s vision and the artist’s, Ed Levine, in “Embodying Thoreau: Dwelling Sitting, Watching,” created in 2003. The three elements are scattered throughout the park, kind of in a line that the Pennypack Creek serpentines in and out of, creating the illusion that the distances between them are vaster than they actually are. 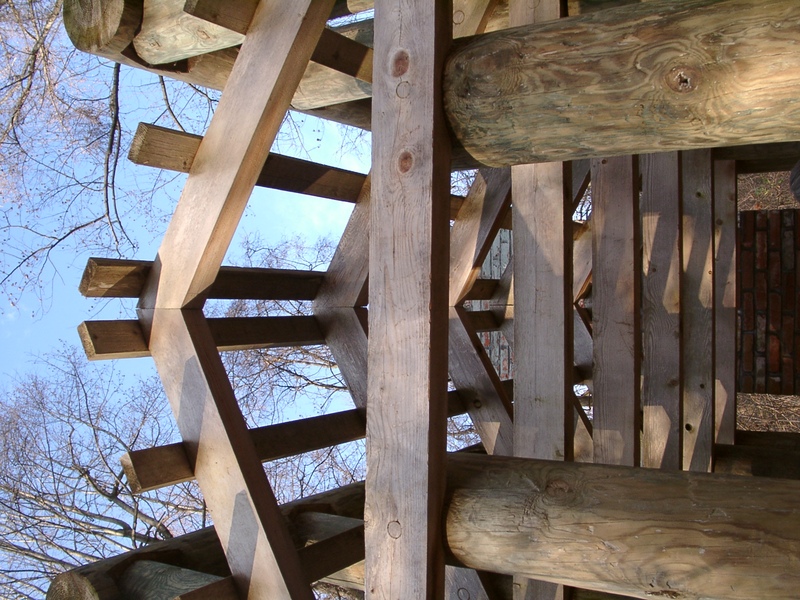 The structures are in the tradition of follies that one might have encountered in a 19th century broad-lawn garden but not as readily visible since the park is heavily wooded – the search for them is a journey in and of itself. 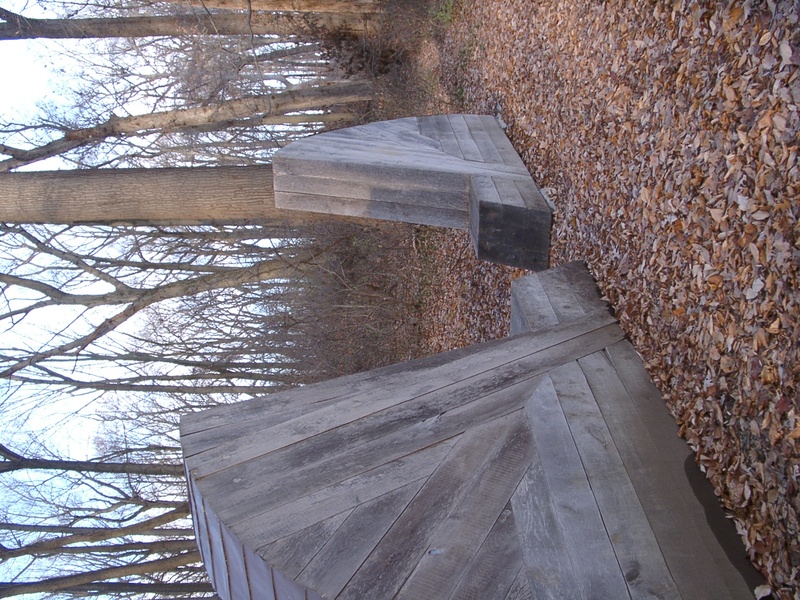 All three are made of wood, and each element deals with a theme present in Thoreau’s self-sufficiency experiment – dwelling, sitting, watching – expressed in architecture, sculptural seating and an interactive environment for birding, respectively. 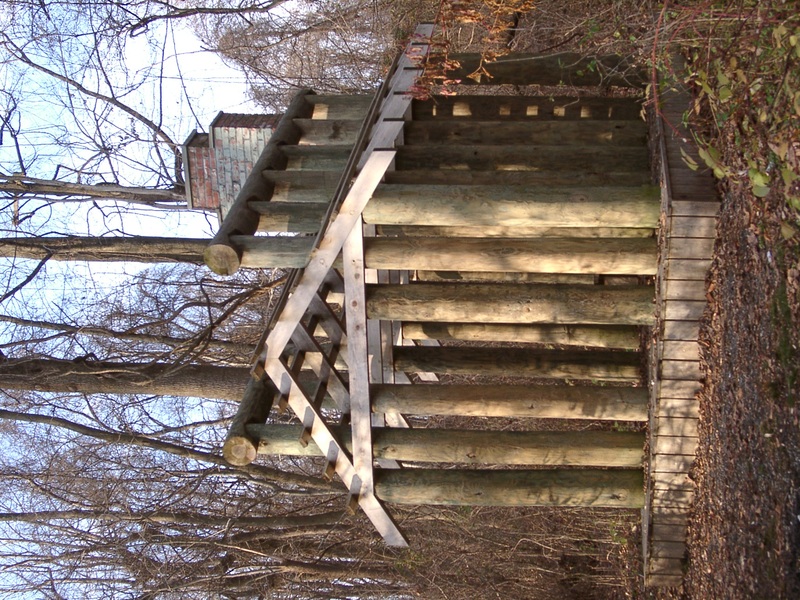 The “watching” Bird Blind is an innocuous-looking peaked-roof shed, whitewashed, and flat as a sign board on its human-facing side on the path. 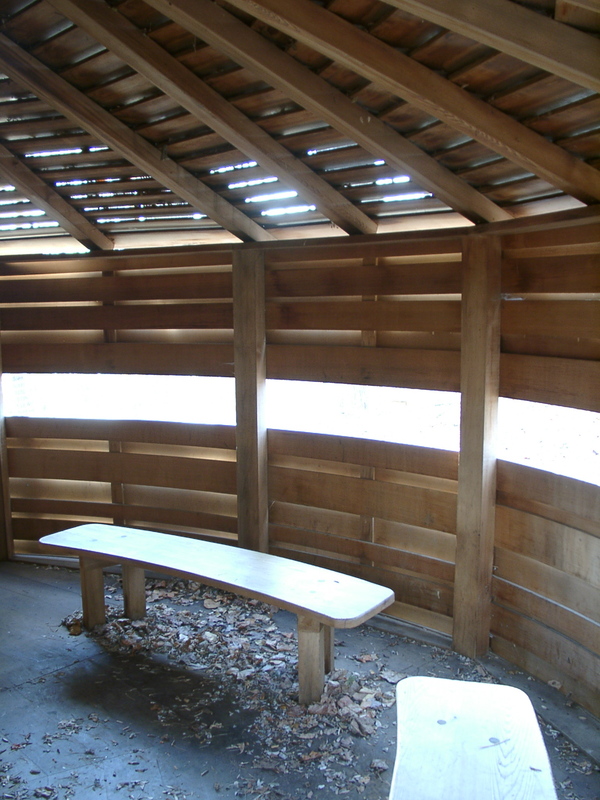 Its single opening leads inside into a semi-circular walled and roofed space, built of horizontal woven-wood slats with one course of slats missing about 3’ from the ground to allow a 180° view out to the bird-facing side. There are curved wooden benches that follow the contour of the wall and lovely sun patterns coming through the slats and the viewing window, animating the space’s enchanting tree house feel. Its abrupt facade on the trail side is totally transformed within the structure, its curved backside interacting well with the site, a tree-covered area with many staked bird feeders providing a stage set for the viewers watching from their helmet-like subterfuge. The second part of the pilgrimage, the “sitting,” is sited in a place where you could easily miss it – off the path, down a slope but still high above the creek on a kind of bird’s eye view perch. 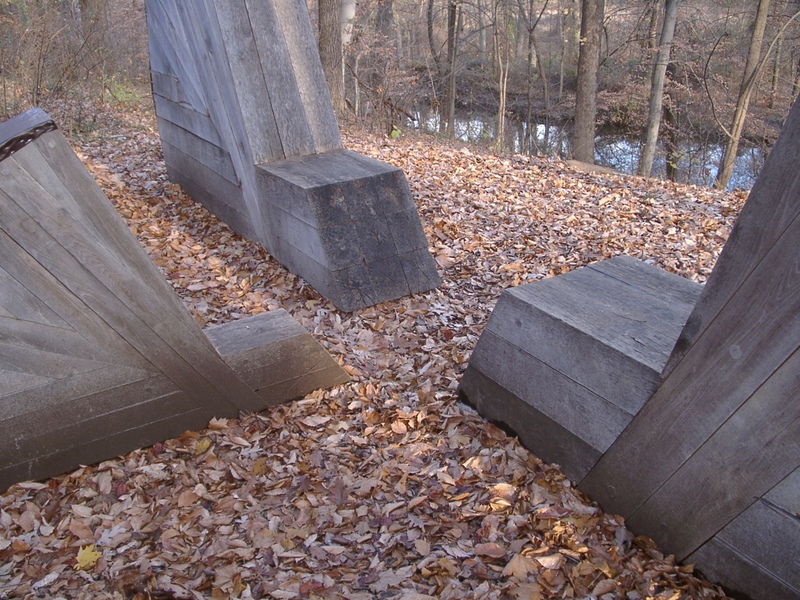 The Benches are huge and bulky wooden wedges, like a cut cheese wheel or an old abandoned waterwheel broken apart and half-buried – it could be, in a sense, a solid manifestation of the negative space of the Bird Blind. There are three of these seats, a family grouping in a circle looking in and resembling a standoff among peacocks about to reveal full display. Their relationship to each other as well as to the opening in the forest in which they are placed make them seem like a remnant of some ancient purpose, perhaps a sundial or directional markers. The most hidden of the three destinations is Thoreau’s Hut, the “dwelling,” but it is very much worth finding. 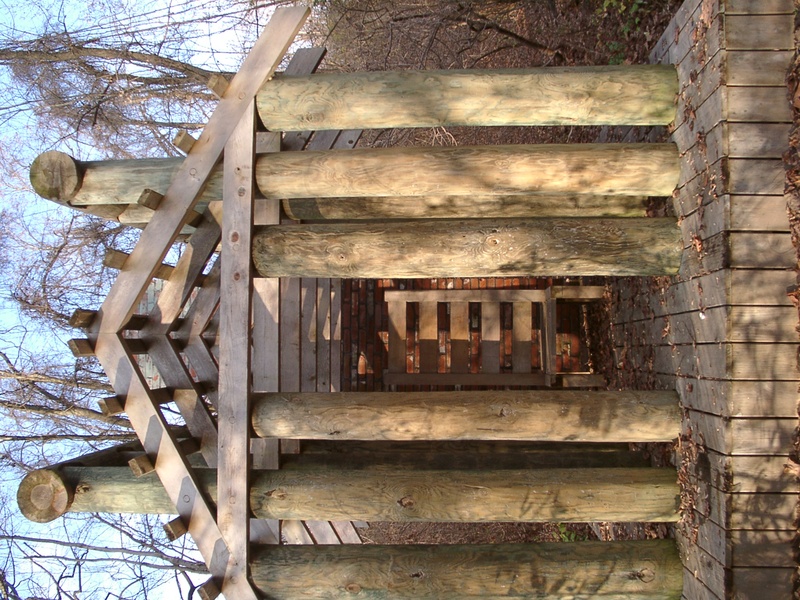 There is a kind of disconnect, after making your way deeper into the woods, in seeing this structure peek out over the large shrubs and small trees, gradually appearing in full view. 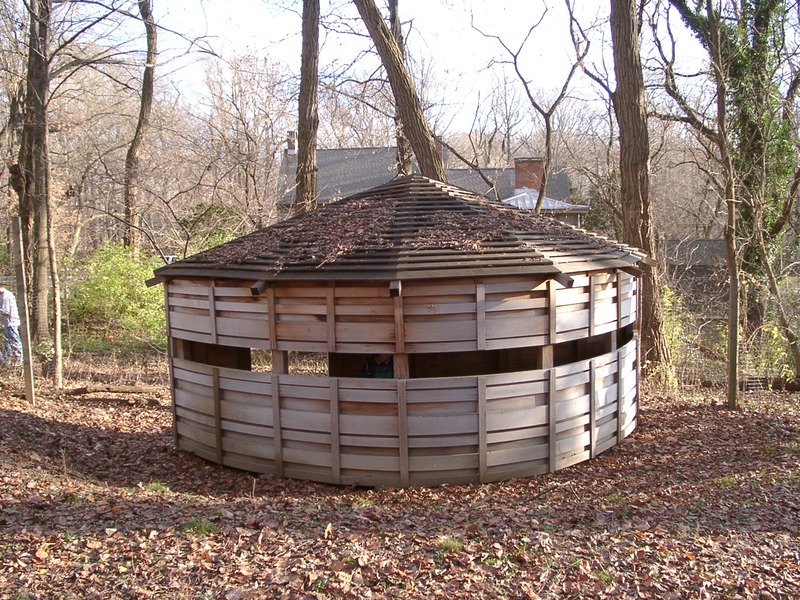 Although the dimensions are the same as the original cabin in Thoreau’s Life in the Woods, the similarity ends there. This hut is poetic, whereas the original was perfunctory. There is, in this rendering, a world history of architecture: echoes of Greek temples; Native American log buildings; Scandinavian vernacular; Maori post-and-beam; West African or Egyptian architectural resonances. It is a pavilion more so than a house, heavily constructed but open to the elements, simple and elegant despite its weighty materials. At one end is a brick chimney – the only literal reference other than its plan measurements – and a tall ladder-back, double-sided chair facing both in and out. More a suggestion of shelter than an actual shelter, this cathedral-like homage to Thoreau and his quest is a fitting attestation to his lasting impact and still-necessary voice. The three parts of this Fairmount Park Art Association-sponsored project are well-situated and, if not perfectly integrated in a physical sense because of their mass, are so, indeed, in a spiritual one. Enhancing the natural experience, they interpret it through human invention, creating a placeness at each location, as well as marking a memorable and honorable witness to our place in nature, in tandem with what Thoreau showed to be possible. What we’ve written, here, up till now, and probably just about everything we’ll post from this point forward, has to do with places we’ve been in that are real. But, thinking about the death of J.D. Salinger (which we seem to be doing a lot), and of his work’s impact on American literature and readers’ lives, it’s appropriate, we believe, to ponder a special place that we’ve explored frequently over the decades, a place we’ve found ourselves drawn to at times when we need reassurance that there is a good place to be in – a place that is not “real,” but that, in its power of placeness, its emotional completeness, its warm hug and wet foot-kiss of circumstance and its inherent intentional artfulness is as fully real and realized as any place we’ve ever “seen” or been. That is, Salinger’s world, and, more specifically, his New York City. Salinger’s New York is what made us want to live in the actual one, which we did for a time, until we came to understand that the two weren’t the same. Salinger’s New York was an island full of the grace and elegance to be found in the miraculous commonplace; the actual New York City, although anything can happen there, was not these things. His New York was one where buses full of Comanche Club members could unload into a Central Park that was bright and safe, except for the breaking of a heart; even in its most malevolent, in the darkest Holden Caulfield moments, it was a benign, odd but seductive oasis. Not just a place, but a place to be and know. But, whether in New York, or England, or Florida, or on a dinghy by a dock, it wasn’t the place that provided the placeness that was Salinger’s signature and literary bequest: It was the talking people. He created, or distilled from life, people who defined the environment: their presence, and the conjunction of their minds in proximity, and the way they spoke those minds or put up wry, tragic, verbal smokescreens to hide their feelings, built whole worlds that felt like small rooms at land’s end. His is a populace who are grossly insensitive and grossly oversensitive, often at the same time – self-centered people whose centers cannot hold. Except for children – they are precocious, repositories of incisive wisdom, and Paradise lost. And they’ll melt you with their earnestness. 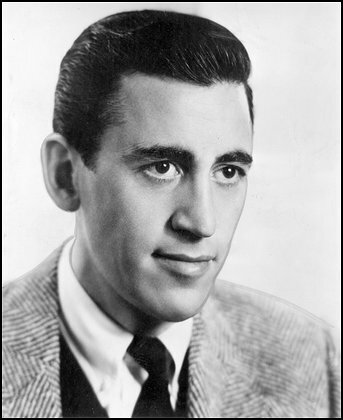 Salinger space is the space between: six inches away in the same bed could be an unbridgeable gulf. We’ve never met anyone named Boo Boo Tannenbaum, but we’ve known some. We’ve never met any family like the Glass crew, but we would like to think that they could and do exist, if only to reinforce the idea that there are, as in Seymour, true saints in the world, and that, as we all slide or are shoved toward a new Dark Age, that there may be those who will not go willingly … or, at least, quietly. And their sarcasm may save us yet. In the cocoonish place that the art of Salinger constructs around us and his characters, there is the aroma of words in dialogue, spiced with the most perfectly positioned italics in all of post-war writing. Language usually limns character, but Salinger uses it to erect knowable universes. We would recognize Pencey Prep if we came upon it; the Glass family bathroom is as much a place we’ve been in as any we are sitting in right now. Even outdoors, for Salinger, people are in rooms – smoky rooms, usually – where everybody’s wearing an overcoat, too big or too small, of some material no longer acceptable or available. Even blindfolded, we would know we are in Salinger’s world if we could hear the inhabitants speak. J.D. Salinger’s work is the epitome of arslocii – the rendering of a placeness that, transcending earthbound limitations and expectations, becomes art itself. We can only hope that, in some New Hampshire safe somewhere, there are a few more novels and stories waiting to be explored, because we could use all the wonderful new places, full of love and squalor, that we can lay our hands on. There is something in us humans that, even in the outdoors – especially in the outdoors – compels us to compartmentalize and limit, contain and reduce, so that we can wrap our infinity-loathing minds around the ungraspable unendingness of the land receding in all directions from us. Good walls make good neighbors … with the rest of creation. Thus, in larger gardens, one is almost assured in finding, accompanying the open space, one or more garden “rooms” – spaces designed to offer a protective intimacy that nature, even manicured nature, does not afford: controlled environments within created environments. Many such rooms are merely decorative rest stops; some are thematic. Whichever, it is odd how pleased (even relieved) we are to come upon them, and how comfortable we feel when we are in them. Along Philadelphia’s scenic and winding East River (or, Kelly) Drive, up the road from the Museum of Art, moving north and away from the city and not far past Boathouse Row, are three “rooms” that one, speeding by in a car, can easily miss – collectively, the Ellen Phillips Samuel Memorial Sculpture Garden, named for a culture maven who left most of her estate to the Fairmount Park Art Association. 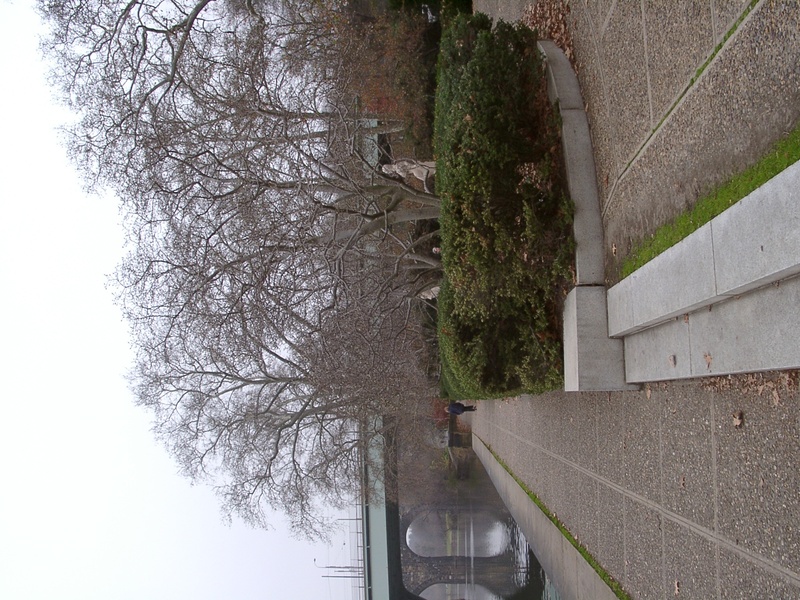 This tripartite memorial, according to a marker, is designed to be an “emblematic history of our country.” These three terraces, or mini-plazas, are separated from each other by short distances and circular fountains, and accessible from paths that run either along the Schuylkill or alongside the road. 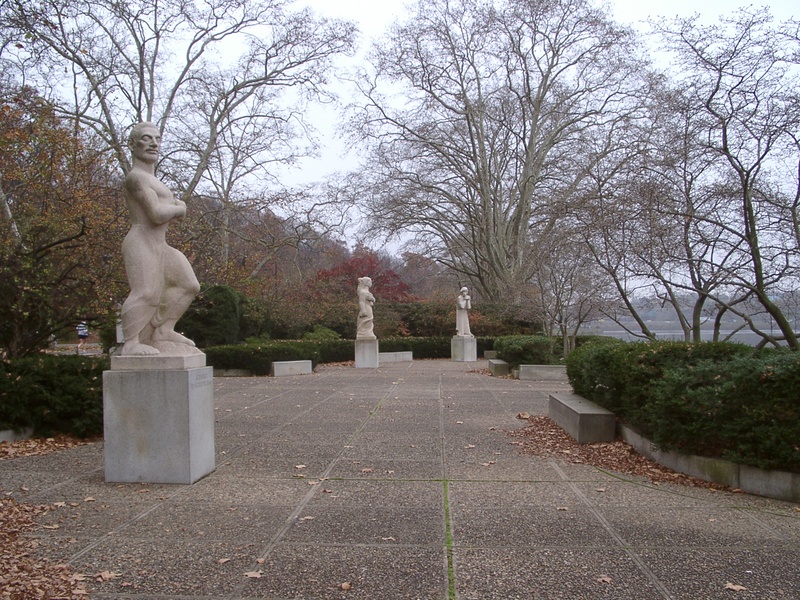 In each of these terraces are sculptures, and quotes chiseled in stone; there is something very WPA-ish about it all, a pervading style of a time when public art was erected for the common good of all citizens, and was seen as a way to promote and promulgate the civic ideals and ethos. While the Memorial was built in stages, and some of those stages fell within that works-progress federal period, the dedication date given at the Memorial is 1957 (and, on the Art Association’s Web site as 1961); it’s hard to remember, but, in an Eisenhower-era, pre-Watergate world, maybe we all still held those “Mr. Smith Goes to Washington” ideas about government and its positive role in our lives, which these Samuel areas propose. It is certainly a bit of history now. The southernmost terrace, and the larger central terrace, symbolize, another marker states, “incidents in our history: settlement of the seaboard, forming a nation, spanning the continent, welcome to all peoples.” The central was the first built, the south terrace the second, and they are – and especially the central, which has the feel of a propagandistic, quasi-Fascist, monumental rallying plaza – open and expansive. But, like our national history, perhaps too much so, and, though full of art and thought in a hardscape setting, empty and lacking something – something that the non-Puritan, non-manifest destiny soul requires. They are lessons, not conversations. But that “something,” that resonance, that arslocii sense of placeness, resides in the remaining, and last built, “room” where, the marker tells, “is expressed the inner energies of our national life.” And these being “inner energies” not outward accomplished tasks, this “room” designed for them is, though strong, a quieter place than the others, more meditative – a place of contemplative repose. Some of this imbued mood is, perhaps, a direct physical result of a landscape-architectural decision: Whereas the central terrace has wide entrances on both road and river sides, and the south terrace seems too big and long and hard, this northern terrace seems more a pocket park unto itself, almost entirely blocked from the road by a green wall of hedges and shrubs, thus truly creating a “room,” a shelter, with a picture window on the flowing water. 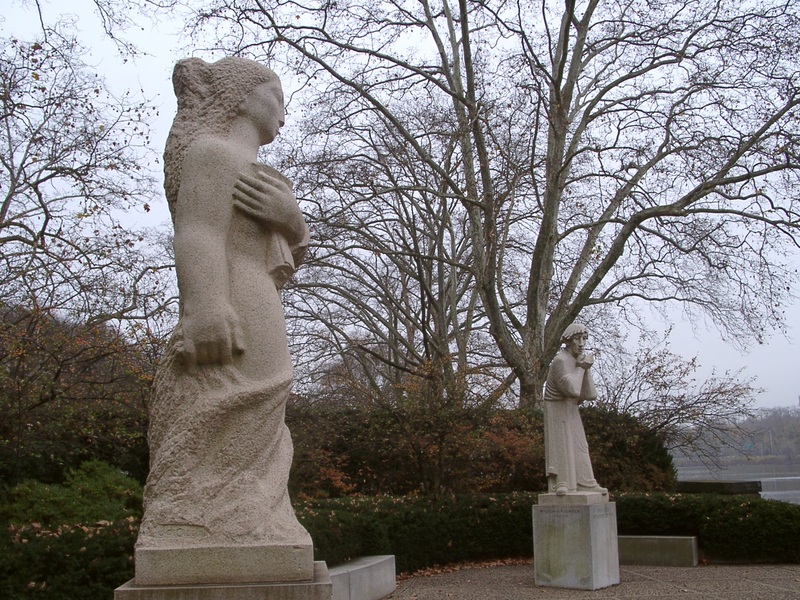 In this “room” are four figures, created by sculptors – Ahren Ben Shmuel, Koren der Harootian, Jose de Creeft and Waldemar Raemisch – far less well known than, say, Jacques Lipchitz, whose piece “The Spirit of Enterprise” in the central terrace (moved there, smartly, from its original home in this northern terrace) is much more massive and much less integrated and involving. 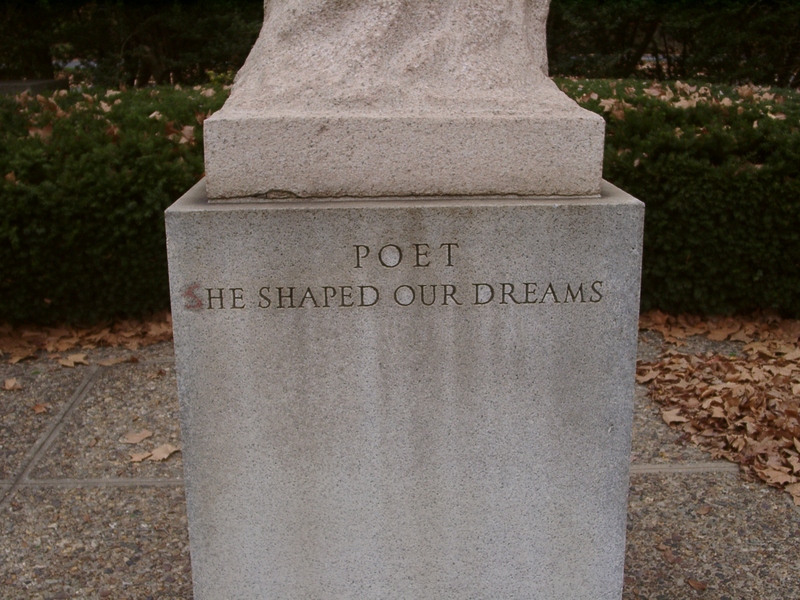 The four figures represent, as their pedestals indicate: “Laborer – He wrought miracles”; “Scientist – He weighed the stars”; “Poet – He shaped our dreams” (although, the figure, very female in form, gave impetus to someone with feminist leanings to scrawl and scratch an “s” in front of the “he” ); and “Preacher – He guided our ways.” These strange, almost ghostly, haunting figures have a type of spiritual life to them, a sense of either just being formed or devolving back into their blocks of stone. They engage us by not trying to; we are drawn to them, instead of how, in the other terraces, the works seem to impose themselves on us. To come upon this “room” by accident is like going for a short sailing voyage and encountering Atlantis. But to visit for the tenth time, or hundredth, takes nothing away from its depth and its ability to make you think about what it wants you to and what you want to. It is art in its totality, and engenders artfulness of thought in those who enter it.